Come winters and our capital’s streets and markets come alive with the aroma of delectable warm,oily, spicy (or sweet) snacks. And mind you, keeping in sync with the sentiment of the so-large ‘total vageetarian’ community, the ubiquitous and your nearby Aggarawal (both single and double ‘g,’clans) or Nathu halwaiwala, will perforate the evening air with aromatic and definitely mouth watering dishes like the Aloo Tikki (No, Mashed Potato patty is not a close English cousin or synonym), Samosas, Kachori, Moong-Dal-Halwa, Gajar-Ka-halwa, Paneer Tikka, Gulab Jamun and a host of others. If in these evenings you loiter or pass around the market and not caring whether you have a flat six pack tummy or one of those half-globe ones, you cannot deny the temptation to have feasted on these delicacies once or every possible time. It’s just so in our Delhism to not deny these beauties from adorning our big mouths. Top all this with a plate of piping hot jalebis and you are set to feel like a king/queen. If you ask me, in my humble opinion, this sweet twisted dish (hardly actually, if you consider a fermented dough of flour with some essence a dish) is the queen (assuming it to be feminine) of all winter desserts or street snacks. Well, to my assumption's favour, the Jalebi is certainly royal in her appearance and not one of those all-round-or-fluid’ desserts. The saffron colour adds an edge to the royalty and finally there is always a struggle to get your self a plate of her. (Kind of makes it elitist) Besides, like a benevolent royal, the Jalebi, creates a joyous atmosphere for the people consuming it. Don’t believe me - Observe a group or even yourself when you bite into a piece. There is a sense of immense joy, almost as if all your problems have been taken care of as the deep fried and sweetened dough melts in your mouth and the sweet syrup rushes down the gullet ; then you bite into another and another, till the feeling infiltrates your senses like a drug. That is the royal Jalebi for you. If that was not enough, then one can feel her elitism when one tries to get an audience with her. Like suitors for a marriage, you are given numbers of when will she grace you. The attendant (the sales-boy) will nonchalantly scribble a number on your token slip and call it out almost as nonchalantly. No one messes with the high priestess and if you want her grace, then you weather the wait. In our friendly Agarwal store, I have not seen many refuse the number even though that would sometimes mean an hour long wait. In my own case I would not wait that long for a doctor, but Ms. Jalebi has her own charm and I succumb to it. In the numerous plates of Jalebi I have consumed all this long, there was this epiphany today. This simple Indian dessert in many ways is also a philosophy of life itself. No, seriously. The ingredients, the shape, the cooking process and then finally tills its consumed, the Jalebi is life incarnate and if you are connoisseur of the dessert as much as I am , then you will agree. Let me elucidate. 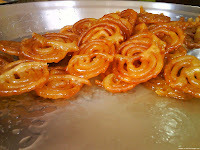 Fine wheat flour mixed with butter milk is fermented as the dough for jalebi. Wheat flour is life, butter milk the experience of life and the fermentation is time. (This is not heavy, trust me) One can add saffron and essence to this batter, just as life has its share of emotions, good friends and other elements which ferment along with it. Now, after an overnight of fermentation (not excessive) comes the real cooking. The batter is placed in small quantities inside a muslin pouch which has a small hole. The cook will then artistically make concentric circles of the batter dropping out of the hole into heated oil, where its fried. The boiling oil if you consider can be the trials and tribulations that one’s life is fried in. The shape of the Jalebi is how one’s life is - never a straight line but layers of concentric circles, sometime touching each other and sometimes much dispersed. One can never escape this part regardless of who you are. This is the precedence to the best part, yet to begin. Only after the Jalebi is fried just enough to turn golden brown, that its immersed in a syrup of sugar for a short while, though long enough for it to absorb the sweetness before its served piping on your plate. The same way, life will fry us only enough and give us an opportunity to be dipped in the sweet experiences, which in the long run will be all that matters. And one cannot claim that there are no sweet experiences in one’s life - that will be saying one did not live at all. Better still, look at this way that despite all the fermentation and frying, its the taste of the Jalebi that lingers in your mouth, the joy that it brings in consuming it. So, if one can treat life as an experience through which we can bring joy to others and remain as a sweet memory, one has just Jalebied oneself. Profound - Not exactly, but what the heck, it was a thought and I take the pride of coining this as the Jalebi theory - something I wish 2012 to live by. 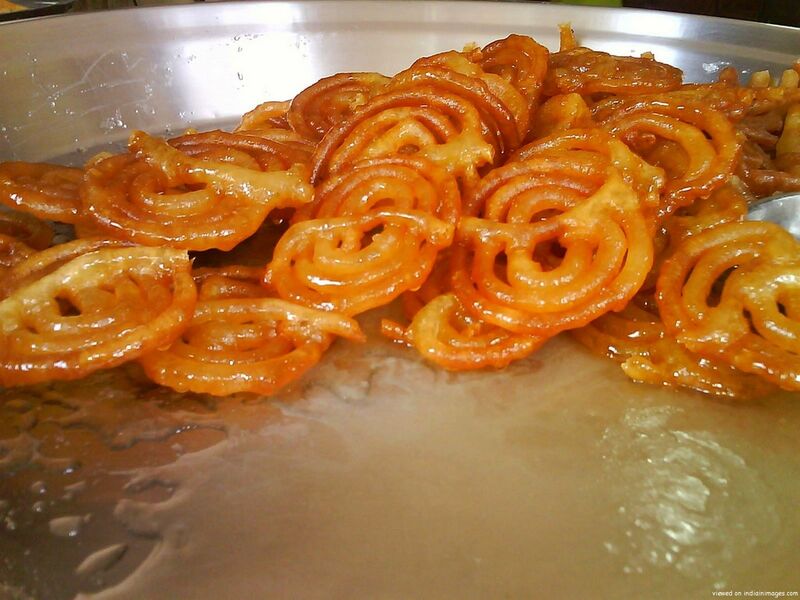 Next time you gorge on a Jalebi, do not think of the calories; think of it as a learning of life, a bodhta. If that is heavy duty, then just consume it for the sake that it sweetens your taste buds.